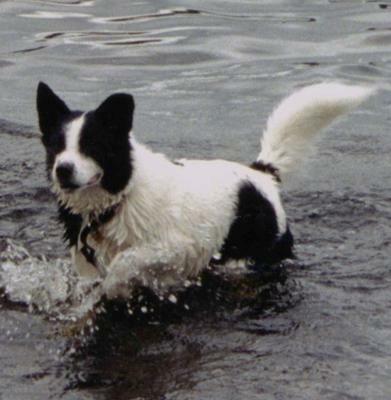 My dog Charlie was a cross border collie. I rescued from R.S.P.C.A when he was around five years old. He was very playful, well mannered and loving. The first day I brought him home he followed Fred the cat to the litter tray, he didn't seem to notice me sneakily watching them. He sat patiently while Fred took a leak, then to my amazement, Fred hopped out and Charlie hopped in, I shouted in the background "no!" he panicked and jumped out, he was trembling. I showed him into the garden and from then on he knew not to copy the cat. I felt I had struck gold when I got him and I was determined to keep him till his old age. It was a lovely day as I watched him bouncing about in the garden, he pulled on one of the garden canes tossing it up into the air, I didn't see the danger and I let him. The cane slid down his throat, he had bitten into it with fear which allowed the first half of the cane to slide down into his insides. I held him while he stood and I felt his chest the cane could be felt central at least 10 inches had gone down. the cane, I carefully put my hand down his throat and gripped it with my nails I pulled slowly and near 12 inches of cane came up. There was a little bit of blood but my dog seemed to come alive, opening his eyes and taking a deep breath. I knew I risked damaging him internally but I was sure he was not going to make that journey if I didn't do what I did. I would NOT advise anyone else to do this as I only did it as a last resort. Charlie made it to the vets for some antibiotics and an examination. I had to use a syringe to disperse water into his mouth as he was to sore to eat or drink. Soon after a lump appeared on his throat where a splinter had remained and tried to work its way out of his body. He had to have an operation but was lucky to have got away with not having more splinters. I keep my house and garden dog safe now days and I warn other people about the dangers of letting there dogs play with any kind of stick and that even allowing your dog to be around garden canes can be hazardous. Charlie luckily lived a long life but recently passed away at the age of fifteen. I see countless people throwing sticks to dogs in the park. Lots of dogs have serious accidents sometimes even fatal when playing with any kind of sticks, please be aware, buy your dog an appropriate size ball that is safe rather than taking a risk you might regret. He was a beautiful dog! I have a little border collie, 8 years old, who loves sticks. Nice to know this.